Lucy and Owen meet somewhere between the tenth and eleventh floors of a New York City apartment building, on an elevator rendered useless by a citywide blackout. After they’re rescued, they spend a single night together, wandering the darkened streets and marveling at the rare appearance of stars above Manhattan. But once the power is restored, so is reality. Lucy soon moves to Edinburgh with her parents, while Owen heads out west with his father. Lucy and Owen’s relationship plays out across the globe as they stay in touch through postcards, occasional e-mails, and — finally — a reunion in the city where they first met. A carefully charted map of a long-distance relationship, Jennifer E. Smith’s new novel shows that the center of the world isn’t necessarily a place. It can be a person, too. I had high expectations from this book after reading The Statistical Probability of Love at First Sight and loving it completely. Sad to say, the effect did not follow through for this one. This book had a very promising start. I loved how Owen and Lucy met at a compromising situation and how they bonded over it. After the first 3 or so chapters, it got dragging. I found myself mostly skimming the chapters since most of them are fillers and had no true connection to the plot (or so I thought). 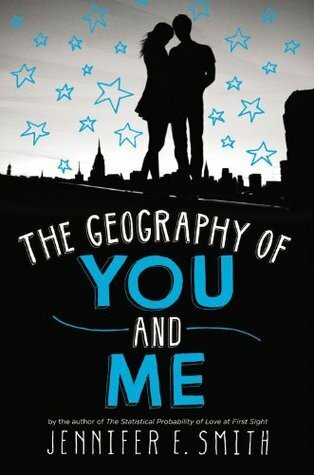 The Geography of You and Me had its hits and misses–mostly misses, actually. I originally gave it 2 stars but then upgraded it to a 2.5 since it did have some cute moments where I was squealing and smiling really big. It also has a handful of quotes! “It is what it is…” he murmured, letting the words trail off at the end. Sorry it didn’t work out for you! I have those moments, too, where if I rated a book on the feeling it gave me, it’d be pretty low, but I upgrade it because I remember some cute or funny things.